Cut- At mid season after the blooms have faded, cut some common plants back by about a third. 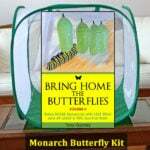 This promotes fresh plant growth and could get you an extra generation of monarchs on the fresh new leaves. Leave some plants uncut if you want to harvest milkweed seeds in fall. I have 4 common milkweed plants with about 26 seed pods developing – I want to share some seeds in the fall but 26 mature pods too many, just trying to put bands around them so they do not open and spread seeds everywhere, would be a challenge. Can I cut some of the pods off and leave a few on the plants to mature? My common milkweed plants have multiplied and are about 14-16 inches tall. They have never bloomed however. There are black aphids (I’m guessing) on under side of leaves. It’s mid July and I have never seen a bloom on them. Hi Kim, where are you located? Tony: I received a shipment of 32 milkweedplugs today 7-15-18. All the plants are 8 to 12 inches long and laying flat…(due to the std packaging method). If I plant them now will they straighten up?? Or should I give them a couple days. Any recommendations? Hi Ed, I would plant them as soon as possible to get them acclimated…they should recover. good luck! Hi Bob, we don’t ever feed caterpillars milkweed like this so I’m not sure if there are any potential issues (I’m not aware of any, but never heard this question). Of course, you do want to pull the plants so it doesn’t spread to your healthy milkweed. Is milkweed with a bad case of the yellows (Phytoplasma) still okay for feeding caterpillars? The plant has way too many leaves mostly at the top, they are small and yellowish, and eventually lots of tiny branches (witch’s broom.) You’ve probably seen wild milkweed like that. I think it still okay is because I find eggs on them, and yesterday found a large cat on a plant like that. I need to cut the plants down so it doesn’t spread, and don’t want to waste them. I don’t now if the infection goes all the way to the roots or not. I have someone from West Babylon NY, offering to ship common milkweed for free! I can always use milkweed, but I’m not sure if common milkweed will grow in Southern CA, specifically Orange County, CA. Can you please let me know, as soon as possible? Hi Julie, I don’t think it will thrive in your region…if you try it, I would opt for planting (at least some) in partial shade. good luck! I’m in Orange County too! Did you have any luck with your milkweed? Flies are pollinators…I would not worry about this. The lawn service inadvertently mowed down my common milkweed plants, leaving a number of 4-5 inch stalks. It is still early in the season (May) and the milkweed hasn’t gone to seed. Is it possible that the plants will still grow? I’m feeling heartbroken, as the monarchs were flying near the stalks shortly after the service was here. Hi Boo, they should continue to grow…they’ll just be on a delayed growth cycle. good luck! Hi. I have some common milk weed growing by my mailbox. I want to keep it but it grows in a way that interferes with the mailbox. My question is, can I dig it up and transplant to a better location? If not how can I get rid of it so it doesn’t keep coming back? Thank you for the site and all the advice you share. Hi. I am teaching “Help Save the Monarch Butterfly” programs for a couple of communities in upstate NY in mid-May. I have collected seeds and they’ve been in a plastic baggie in my fridge for the winter. I’m going to distribute a packet of seeds to each of the families that attend the programs. How can I best ensure germination success? Should I put them between damp paper towels in the fridge for a few weeks? We generally don’t plant in this area until Mother’s Day. Will the seeds have a chance this year or should I try to start them inside? Seeds would be much easier to distribute. Sorry to bombard you with questions. You (and this website) are a great resource. Thank you. Would it be wise to begin planting common Milkweed seeds indoors until November and then transplant to my garden? Or should I just plant the seeds in the ground in November? Thanks! Reading your site for several hours! ♡ Planning butterfly garden in spring. I have perfect spot for common milkweed, problem is its over run with wisteria, mostly roots as I have been battling this *weed* for 3 years. Do you think the MW would choke out the wisteria? Drainage ditch, only wet after rain. Very compost-y soil. Hi Lynn, sometimes you just have try things and see what works…you might want to di gout some of the wisteria to give the common miw a better chance…good luck! Can milkweed be grown in containers? Hello..i have a lot of the common milkweed in my yard and have had it for many years. Can I cut the top off above my seed pods and not hurt it? Also I have never seen eggs, caterpillars, or monarchs on it. Just bees and swallowtail while it has flowers. Trying to save the seed pods until they are ready and donate them to our conservation garden park. I live in Salt Lake City Uta h.
Thanks for hosting this website, by the way. I’m in Michigan and have found more monarch eggs this summer than any summer past. I am raising about 30 caterpillars plus I’ve got 12 more eggs I’ve found today while harvesting fresh milkweed leaves. Much of my common milkweed supply not only has the shiny reside on the surface like Phyllis had but also has a blackish undertone to the leaves, not like isolated spots but like over the whole leaf(or at least a majority of it). I haven’t been feeding those leaves to my caterpillars for fear that they are contaminated with a fungus or mildew. Is that a safe assumption or is this just the affects of the late season “ugly stick” you referenced in your description? I’m thinking I am going to have to find a new supply of milkweed if I can’t use those leaves. 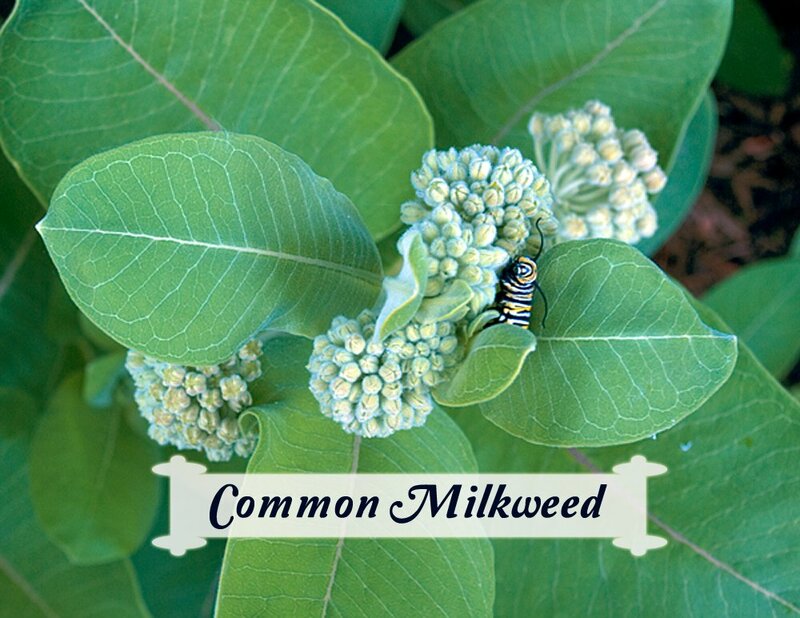 Hi Tracy, this is about the time of year common milkweed starts to become a less-used host plant. We feed our monarchs common from spring through the beginning of August by taking stem cuttings. This promotes fresh growth from those plants so some of the common stays viable longer. Otherwise, we use swamp and tropical. I don’t worry about common milkweed looking bad this time of year…it’s become an annual tradition. This is my second summer as a “Monarch Midwife”. So far everything is going ok. But I have notice some of my milkweeds have a shiny, clear residue on their leaves. What would cause this? My neighbors and I do not spray our yards. I was wondering if the extreme heat we are experiencing now in central Indiana has anything to do with this. Also, are these leaves safe to feed to my caterpillars? I always rinse my leaves before feeding. Hi Phyllis, oleander aphids secrete a sweet honeydew liquid that ants often ‘milk’ from them on milkweed plants. I would not worry about feeding these to caterpillars but I always suggest rinsing. I have so much common milkweed this year it is literally falling out of my garden. It is so heavy and just falls over. The bees love it. No monarchs yet. i did release 4 butterflies way back in may from a white milkweed plant. havn’t seen any monarchs at all. Last year they all arrived late in sept. This year i planted 10 times the milkweed in 4 different places in my garden. The bees love it. Tony some of my milkweed has giant seedpods on it. Never saw these before . What do I do with the seed pods. They look like they would hurt to touch them. How do i harvest the seeds ? I live in Atlanta, Ga. My common Milkweed plants (Asclepias Syriaca) are large,lush and are multiplying beautifully, but after four years and tons of plants, there are still no blooms. What is the problem, do you know? Hi Thomas, do they get a fair amount of sun? Also, this might be a regional issue. They flower a lot in our northern region (Minnesota) You might experiment by planting or transplanting some in a different area of your yard. I live in Marietta, GA and my common milkweed doesn’t bloom either. I’m going to try a different location with more sun. Can it take several years for common milkweed to start blooming? I have some milkweed in my yard that was serendipitously sown (i.e., not planted by me), so I’m not sure what species it is. I know that it’s milkweed because monarchs have been laying eggs on it (yay! ), and from the size and shape of the leaves, it looks like common milkweed, but I’m not sure because it hasn’t bloomed at all yet. The plants are at least a year old, and I know some other species of milkweed can take several years to start blooming, so I wondered if this is true of common milkweed. I’ve seen syriaca plants growing in nearby local parks, so I know it’s at least possible for the seeds to have reached my yard. On further observation, I suspect that the reason those milkweed plants haven’t bloomed is because they’ve been infested with earwigs. Yuck! Any tips on getting rid of those pests? Two years ago, before I knew better, I planted Common Milkweed in a perennial border where it is taking over. I plan to remove and try to transplant it either this fall or next spring. I’m trying to figure out a place to put it where it can run wild and be successful. Can you tell me whether mature plants or harvested seeds can be expected to grow in sandy, dry soil? By dry sandy soil, I mean almost sand dune but with amendment from years of scrub oak leaves and pine needles decaying. Once established, the plants will not be watered whereas the spreading ones get irrigated. Second question is how will I know if monarchs have found my plants? Thank you. FYI, I’m in southeastern Massachusett. I lost all of my swamp milkweed over the Winter. So now I’m searching for common milkweed in my area. What is the best way to tell milkweed and dogbane apart. I don’t want to get cats and not have anything to feed them. I haven’t seen any Monarchs so far so I can’t tell by eggs or cats on the plants. I purchased Purple Milkweed from a local native nursery last year. The plant didn’t bloom, which I chalked up to it being young or not sunny enough. Fast forward to this season when I find that my one “Purple Milkweed” plant turned into about 8 or 9 plants. After further research I now believe I was sold Common Milkweed. I have Butterfly Weed and Swamp Milkweed growing nearby. Am I in for an uphill battle? 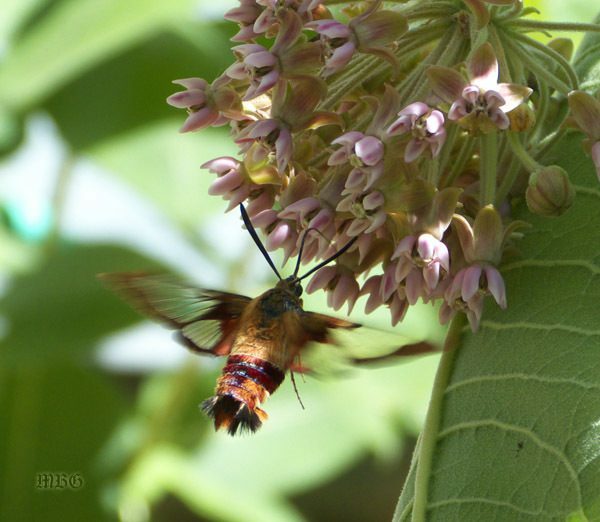 Will the Common Milkweed crowd out the other plants? This is in a wooded section of my property that I am dedicating to milkweed, but I wanted different colors, hence the different milkweed choices. Will just pulling out the plants I don’t want help? I did call my local extension office, but I didn’t really get much help. And, in researching this online, all I can find is several resources saying Purple Milkweed does spread through rhizomes, just not as aggressively as Common Milkweed. But, my seedling pictures look like the picture above. And, I contacted the nursery to see if the owner (who sold it to me) could help me be sure of what I have, but I have yet to receive a response. Hi Francine, if it produced that many new plants without seeding, you are probably correct on the ID…frustrating when that happens. You will be able to tell for sure when it blooms this season. Yes, if you don’t want plants just pull them…also cut off the seed pods before they burst this fall or you’ll have even more new plants. Common milkweed is a great species to have for supporting monarchs, but you do need to take those precautions if you don’t want it to take over…good luck! Just found your site this morning! Thank you for this info! I planted some common (and other varieties) last year but didn’t know they put out rhizomes until this spring. They are everywhere in my perennial garden this year! Can I let them produce pods with the capture method you describe here (thinking organza bags) and then just dig up at the end of the season and relocate to a space where they are welcome to expand at will? Will my perennial garden be okay or will the rhizomes continue to take over year after year? Thanks again for you work on this site! I have a question as to the best time to remove a common milkweed plant when cleaning up the garden. I have been keeping them all year around fearful that I’ll destroy the habitat for the monarchs. Also, common milkweed grows up into Canada, however, is it still providing some benefits to the monarchs way up north? I would like to get my sister interested in getting a garden started for monarchs and she lives in Vermont. I may bring her some seeds to get started. I appreciated your site very much. Not many sources on this subject outside of the internet. Thank you again. Hi Mary, in late fall (or next spring) you can just pull up the stems…they won’t be attached to the root system anymore. If a stem doesn’t pull easily, leave it and just cut it back…good luck! This is late but I’m just getting back to this site. Thank you for the response. I’ll take care of removing the milkweed this month. Thanks again. To answer your question about Common milkweed way up north….I am in Toronto, Ontario Canada, and have some in my garden. Yes! Absolutely it is a help to the monarchs. They make their way here to Toronto, lay eggs on milkweed, and the caterpillars’ life cycles begin again. Toronto, being positioned on the north shores of Lake Ontario is lucky to be in a position to witness many amazing migratory species throughout the fall, including butterflies making their way south to Mexico. Birders, as well, have tremendous opportunities to watch migratory species as they stop near the shore to fuel up before making the journey over the Great Lakes. Please encourage your northerly friends and relatives to provide Monarch waystations wherever they can! I live in Southwest Florida and I’ve been looking at more species of milkweed to grow. I have lots of caterpillars year-round here and I’m looking into creating a butterfly breeding cage. Currently, I’m growing Asclepias Curassavica, Incarnata, Verticillata, and Calotropis Gigantea. These are doing great, but I constantly find myself running out and I don’t have a ton of space to grow things around here. I’m really interested in growing common milkweed due to the fact that it is fast growing and the leaves last for a long time. If I were to grow it, I would keep it in a large pot and cut off the seed pods to prevent it from spreading since I don’t think it’s native here. Would you recommend I grow Common Milkweed? I already have seeds at the end of the cold-stratification. Just having second thoughts about planting a non-native milkweed that’s aggressive. Also I hear that this milkweed has less glycoside content than the Florida-native milkweeds? Did you do this? Did you have any luck? I am in the same boat as you are. Exactly! I would be interested in knowing how you made out with Common milkweed in pots in Florida if you tried to do this. We winter in SWFlorida and I raise and tag monarchs there. I scramble for food all the time. In the summer, at my cottage near Ottawa, I have fields of common milkweed and am noticing monarchs and eggs lately. It would make my life easier if I could grow common milkweed in pots in SWFlorida. Looking forward to hearing from you. I live in Southern California (USDA Zone 9b). What varieties are available for this area? This year I have started a butterfly/hummingbird garden. I have just purchased swamp milkweed in attempts to give a variety from the common milkweed I have already planted. I have noticed the common has begun to sprout up in some less than desireable areas. Can this variety be “contained” with 12″ landscape edging to discourage the spread via rhizomes or will they spread deeper than the 12″ edging, rusulting in a waste of time and money on my part. I have limited space and would love to have both types but if my ornamental grasses and nectar rich perennials are at risk of being taken over. I may have to remove the common. Any suggestions/ help would be greatly appreciated. Thanks. I’m also concerned about the orange aphids as one of my butterfly weed plants is infested with them. There are also dozens of what appear to be tiny flying ants or wasps drinking the nectar of the butterfly weed plants. I’m concerned that they might be black chalcid wasps. Is there any way to tell if they are chalcid wasps? Are there any ways to deter parasitic wasps from my tiny butterfly garden? Also, any advice on taking care of monarch chrysalides? I found 12 instar 5 monarch caterpillars on common milkweed nearby. A few days later I found no caterpillars but 5 chrysalides. Two of the chrysalides died from what looks to be parasitic flies or wasps. I went out and bought a 40 inch fine mesh cage and carefully clipped the leaves and brought the remaining three chrysalides inside. They all look bright green and healthy from what I can tell and it’s been an estimated 10 days give or take a day or two since they were formed / pupated. – I read somewhere that it’s important to keep them a tiny bit moist so I have a humidifier sitting next to the cage and I mist them with water once a day. Is this ok? Do they need fresh air? I don’t want to risk putting them outside where all these tiny black flying ants/wasps are. I read that common milkweed can spread rhizomes to other plants. Is this true for raspberries, blueberries, or even Apple trees? I have southern exposure that I have already filled with fruits. Do I need to avoid planting them close? Hi Jackie, common milkweed can crowd out other plants. If possible, try to isolate your patch. Otherwise, you can pull plants when they come up in inconvenient places. I live in Bonita Springs Florida, my first generation of cats about 25 grew well and where released. My second generation had some problems most died and I was not the only one with this problem, I talked with members of athe Butterfly Estates in Ft. Myers, and they where having the same problem. Now I have noticed that I have a wasp that goes after the newly hatched I had a plant full and was going to move them into a cage and they where all gone the wasp was the stealer. What can I do about it. I need help. How well will common milkweed do if planted in a large container? If this is an option, what size planter would be best? Also, are common milkweed plants available from nurseries or only available as seeds? I tried to find Butterfly Weed plants but ended up having to purchase seeds (currently stratifying in the fridge). Hi Tony — I was away from home for six days and when I returned discovered that a healthy stand of about ten common milkweed at the back of my yard in northern Virginia had all flopped over. The top leaves were contorted and withered and the leaves immediately below were mottled with dark areas. (The common milkweed closer to my house are still OK.) What do you think is the problem and what should I do to correct it? Many thanks for your very helpful blog. Hi Carrie, common milkweed doesn’t typically need protection unless you are dealing with seedlings. If you are afraid someone will cut them down you could put up a barrier or small sign…good luck! About half of my cuttings have taken hold. The ones that are in potting soil seem to take much sooner. Be sure to use a growth hormone. This is a very hard to grow WEED. Thanks for sharing your experience Kenny! I have lots of common milkweed. Unfortunately most of it is growing among my shrubs. I have been trying for 3 yrs now to “fix” this problem. I have replanted seeds elsewhere (not growing there), i have cut down some (hate to do that). I think the rhizomes are out of control but can’t dig up unless I dig up all my LARGE shrubs. any thoughts? Hello. I have just been given what I suspect are common milkweed seeds, the more invasive version. In an effort to grow them with allowing them to invade my neighbors lawn, I intend to put them in pots. I understand they generally have a long taproot. What is an appropriate pot depth to accommodate the long taproot so I may have healthy plants? Hi I live in Mt Laurel NJ and have been raising Monarch cats for years. I’ve noticed in the past few years that my monarchs are arriving at my garden later and later; almost late august at this point. I’ve been getting my milkweed seeds from livemonarch.com and assumed they were appropriate for my area. Although by late august they are dried up, black, with very few leaves for the cats. It’s so sad, it breaks my heart they have nothing to eat when the plants were so plentiful mid summer. I tried cutting them back to slow the growth but they were still dying off by late august. I either have syriaca or speciosa. I saw a garden several streets away from mine that had milkweed with beautiful wide leaves in september last yr, so I know there’s a better variety for me. Please let me know what that is and where I can buy it. I can’t watch them starve again this year! Thanks for your help!! Tony that’s great advice! I’ll stop agonizing over not being able to make it last into fall and instead stock up on the tropical milkweed, while collecting pods for future seasons. I do have all my milkweed in full sun. I’ll start a new batch in part shade. I am ripping out a south facing hillside (full to partial sun) filled with invasives and want to fill it with perennial milkweed. Will milkweed outcompete weeds (fox grape, clovers, dandelions, etc.)? Can I mix and match varieties or will they eventually all revert to common? I just want to plant and establish once if possible as it is not an easy area to manage. Thanks! Hi Philip, milkweed species like A. syriaca and A. speciosa spread quickly through underground rhizomes so they would probably do well in a competitive field environment. You might want to seek out a resource with first hand experience growing milkweed in fields…good luck! Hi Sheila, it depends on what type of pesticides were used and how much. At this point, the pesticide levels have decreased, but there’s no way to tell if the plants are monarch safe until you try feeding caterpillars again. Good luck! Unfortunately the Nursery where iBuy milkweed was designated just as I was. So we bought milkweed at a big box store’ we asked if the plant were pesticide-free. We were told “yes”. Most of the cats died of starvation or incomplete chrysalis formation. My question is this: I have cut back all of the stems, washed by watering all the dirt, added new dirt. Placed all 4 pots in a cage; now the plants are beginning to produce new leaves; when will they be safe for new cats? I was given some milkweek rhizomes. How do I plant them? I have plenty of wide open space and lots of other nectar flowers for the monarchs. Hi Laurie, if necessary you can add some compost to the soil before planting. Make sure the rhizome is completely underground and keep the soil moist over the next couple weeks. good luck! After many years without a problem, this year none of the milkweed near the house bloomed at all. We had a brutal winter – could this be part of the problem? Hi Elizabeth, it’s possible the mature plants died and these were first year seedlings. Common milkweed plants typically have a shelf life of 4-5 years. Otherwise, we’ve had some brutal winters in Minnesota too, and have never had a problem with common milkweed flowering. Hi! Can milkweed be grown in containers? I have a small meadow [southwestern Indiana] that had just a few common milkweed plants this year. I also watch the milkweed in the ditch along our county road. I did not see a single bloom on any of these plants this summer. We were very wet through May and June, and then had a slightly cooler-than-normal summer. What would cause these plants not to bloom? Hi Julie, if these were first year plants they often don’t flower. Other potential issues could be lack of sunlight or soil conditions. Also, are you sure it’s milkweed and not dogbane? Hi Fred, I would have suggested growing in containers. Other than that, your best option might be trapping them. Good luck! I live in the Twin Cities and 2015 is the first year I have grown common milkweed. All in all I would say I have had pretty good success with the limited number of milkweed plants. I have found several monarch eggs which I have been able to raise to butterflies. I have planted the milkweed in pots since I have little space to plant anything and my sunniest locations require the plants be in pots. I would like to overwinter the milkweed from this season if possible. The pots are very deep 18″-24″ and about 24″ wide. Should I do anything to protect these pots during the coldest months of winter? I can roll them into my garage, but they will not be subjected to any daylight in that location. Any thought on how I can increase the success rate for the established plants? Hi Anne, congrats on your first-year success. I have not tried common milkweed in containers before, but it should work out for you as long as the tap root and rhizomes don’t outgrow the container. If you want to try milkweed varieties in containers without taproots consider swamp and tropical for future planting. I wanted to report success overwintering my common milkweed in a container. The container remained outside during the winter, admittedly a fairly warm one with lows only to about -10 degrees. 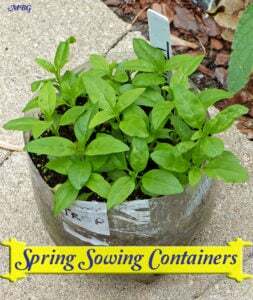 In early April, I started watering the container, in which I also sowed more common milkweed seeds in the late fall. Just this morning, I saw two shoots have appeared not far from the stalk I left in the container to mark the original plant. I also have additional containers with common and swamp milkweed seedlings that have been coming up for the past three weeks. I live in Indiana and last spring planted both common and swamp milkweed which have both thrived. I am raising monarchs and currently have eggs, cats I have found in my yard. I noticed that besides the aphids, the swamp milkweed takes on very deep red color around the tips and edges especially near the bottom of the plant. My question is what is this color mean (disease, age, etc) ? And are these leaves ok to feed to my caterpillars? I have not to date used those leaves as food because they don’t look at fresh or feel as tender as other leaves. As the season progresses, I noticed this color is taking over more of the leaves on the plant. Hi Amy, this is typical of swamp milkweed as the season progresses. I don’t think it’s disease-related but due to a nutrient deficiency. I remove the leaves and discard. I don’t think it would hurt the caterpillars, but if you have enough milkweed….stick with the green! I’m hoping you may have feedback for me regarding my common milkweed patch that is in it’s 3rd year of growth in our SW Ontario backyard. My oldest plants have been slowly succuming to a wasting disease, where typically the bottom leaves start to yellow and droop and gradually turn an ugly dark brown/black…this yellowing slowly moves up the stalk. The first indicator is that the green leaves seem to be curling up before then drooping and yellowing. When flowering, the affected plants drooped at the flower head, as well. There are no visible signs of insect infestation, just the general wasting disease. I’ve removed the affected plants but have just noted today that one of the younger plants seem to be showing the same symptoms. I’m guessing it’s a soil issue or some sort of virus/bacterial infection. Have you had any experience with similar symptoms? In searching the internet, I’ve not come across anyone else experiencing this issue so any feedback and suggestions are appreciated. Hi Cindy, common milkweed usually starts having fungal issues by the end of the season. I just cut back affected plants, and often, healthy new foliage will emerge. I am not aware of any methods to effectively treat the soil for to prevent this. Other milkweed varieties have these issues to a much lesser degree. Better late-season milkweed varieties for supporting monarchs are swamp and tropical. Common milkweed is vital to the earlier generations. Thanks for all your great information, love the website. I would like to transform part of my garden for the butterflies, is there anything I could be doing now to prepare for next year? I have both the white and pink swamp milkweed, along with way to much common, I think. Is there a way to tell the difference between the common and the showy milkweed other than their flowers? Is there a way to eliminate some of it where it’s not wanted? thanks so much for your website. I first planted asclepias syriaca, a few plants from a native plant sale, a few years ago. They love the sunny hillside spot where planted and aggressively spread. i like your idea of cutting the seed pods to prevent further spreading. I’d no idea how much pollinator activity this plant would get! I’ve tried growing the swamp milkweed, but find that it is always infested with, I think, aphids. Hi Tony, I would like to start a butterfly garden with milkweed varieties native to Missouri. Using your resource page (Thank you!) 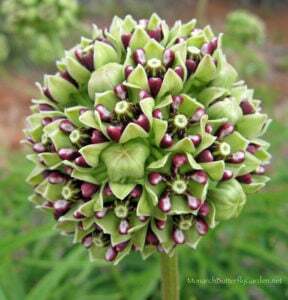 I have found the following Asclepias varieties to be possibilities: Hirtella, incarnata, purpurascens, speciosa, syriaca, tuberosa, variegata, verticillata and viridis. I noticed the warning on Syriaca about the rhizomes being a problem. If I were to dig a three feet wide hole and line it with landscape fabric, would this be sufficient space for a few plants while keeping the rhizomes in check? If so, how deep would I need to dig the hole? Is this something I should do for each variety? Also, with so many varieties to choose from, are there any you would not recommend for a beginner who is also striving to have an attractive garden? Thank you!!!! Hi Carol, we don’t use landscape fabric and I don’t know how well it would control rhizomes. We keep our common and showy milkweed patches in their own sections and pull out unwanted plants when necessary. You could also try putting a few inches of pine bark mulch around it to stop the spread. If you are looking for more attractive native milkweed varieties swamp and its cultivar like ‘ice ballet’ are a great choice and both host/nectar plants. Butterfly weed and its ‘hello yellow’ cultivar are also good choices. Good luck with your new garden! Hi Tony, I want to start a hummingbird/butterfly garden. I understand how important milkweed is to young monarchs and I want to include them however I am afraid of them taking over. From what I have seen on your pages the Tropical milkweed and ice ballet milkweed do not spread underground are they both annuals or just one? And would they be enough to create a welcoming environment for monarchs? A lot of the flowers I have seen are tall 4-6 feet. So I was wondering if there are shorter varieties of milkweed that I can grow so that even if they do spread a bit they will be lower than the flowers. I feel this would give them some protection and also not take away from the colors of the flowers. Hi! I have a garden/goldfish pond, and am in the process of converting my filtration to a totally bog [veggie filter] system. I already have a small bog in my box turtle habitat that feeds through the pond, and I have “swamp milkweed” [A. incarnata] growing in there. Are there any other Monarch-friendly milkweed varieties, such as “common milkweed,” that would do well in this type of setting? Also, is blooming dependent on the age of the plant? Mine range from 1-3 seasons old, and I’ve never had blooms, but the plants have also been subjected to some stress due to moves during the bog-building phases. I live in MN (TC metro area). I’ve had common milkweed growing & spreading in my yard for several years. Last fall (October 2014) I took two of the pods from one area and planted many of the seeds in a new, more desirable spot behind the house. I cleared the area of violets first, then poked my finger in the dirt & dropped a seed in; maybe 100+, then brushed a light layer of leaves atop of the area. Flash forward to May 2015 … not a single milkweed plant is coming up in the new spot (but the violets are creeping back in). To make things worse, I’ve got none coming up in the area where I took the pods from. I’m afraid I’ve shot myself in the foot somehow. Is it too much to hope that seed planted in the fall takes extra time to come up? Could I have planted it too deep? Are the violets a problem? How could I plant over a 100 seeds & not have a single one to show for it? Any thoughts you have would be welcome! Hi Lisa, we have started seeing a few common seedlings in our garden so you should be seeing something soon unless this is a shady part of your garden? Were the seed pods opened (with dark brown mature seeds) when you removed them last fall? I am wanting to plant a few common milkweed plants on my garden. I’m in Minnesota. If I get the seeds it says I need to do the cold stratification for 30 days. Is mid-June too late to plant them in MN? Thank you! Fall Planting Milkweed Seeds Good luck! First of all how do I subscribe to your newsletter. I am a novice at growing milkweed and would appreciate any information you provide. perennials. I am just establishing this garden and curious what other host plants you might suggest for the Monarchs. Hi Pru, how exciting that you’re planting your first milkweed! You could split up 32 plants/plugs into 3 or 4 groupings if you wanted to. There are many milkweed options to consider for your butterfly garden. Check out my milkweed resources page. Each species is listed with its native and perennial regions to give you some good ideas. Good luck with your new garden! I know you’re not a scientist (well maybe you are), but I just read an interesting article that talked about milkweeds with high amounts of latex in them (Asclepias syriaca). The article said that even though monarch larvae of all stages show various behaviors that effectively disable the canal based defense (latex) of the plant, many of the first instar caterpillars were found mired in the leaf latex and glued to the leaf surface despite their elaborate latex sabotaging behavior (vein snipping and trenching). My question is do you find this to be true? I would hate for the girls to be out caterpillar hunting only to find little baby caterpillars struggling in latex. We have never had to worry about this possible problem because we have only grown swamp and tropical milkweed which have much lower levels of latex in them. this doesn’t happen often…in fact, I can’t remember the last time I saw a caterpillar drowned in latex. Common milkweed is my favorite milkweed variety to feed monarchs (until August when the leaves start to fade) because the leaves are so substantial compared to other milkweed varieties. First thank you for your web site as it is most informative. As an environmental teacher, I came across a study that found 85% of monarchs had used common milkweed as their larval food source. Please promote this species as this fact would indicate its importance to monarchs. common milkweed is definitely the workhorse in our butterfly garden. 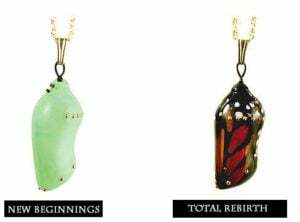 It gets the majority of monarch eggs through mid July. I always tell people to try and plant several species in their garden that peak at different times, to support monarchs through the entire season. I will see if I can find that syriaca study and post about it. Thanks! 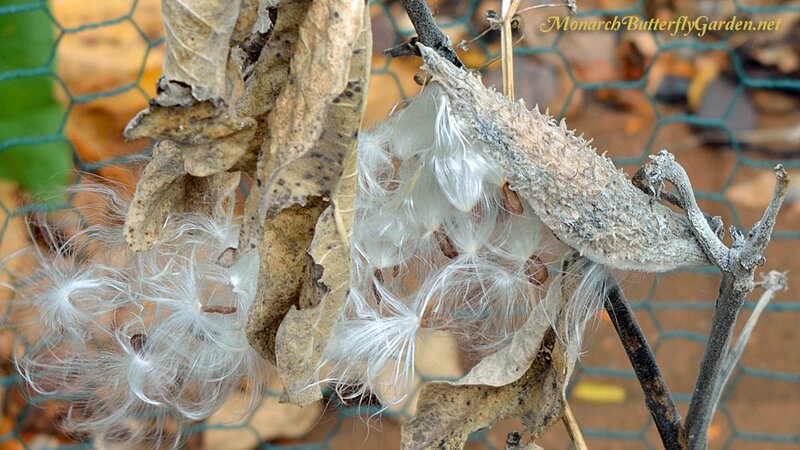 I would like to plant milkweed this year. It is now mid-March and I am in No. Illinois. If I have to chill the seeds for 1-2 months and the wait for them to sprout and transplant, it it too late for this year? Can I sow the chilled seeds directly into the ground? you definitely still have time to cold stratify your seeds, and yes…you can sow directly in spring after the stratification is finished. Good luck! Would it be possible to grow common milkweed in a 4 foot square 12 inch raised bed that sits on concrete? Is it too shallow? I am in New York. Hello! So everything I read about starting syriaca seeds has different information. I harvested the mature pods from my yard last fall for the first time. I kept the pods full of seeds in my very cold garage all winter. Yesterday I brought them in and separated the fluff from the seeds. Here is where I am confused. Do I a) sow the seeds in my trays indoors and start them growing or b) plant them in moist soil in a tray and keep it in my cold dark garage for a few more weeks to stratify them further, them bring them in to start them growing? I am giving many seeds away as well and want to provide the clearest information possible to let everyone know exactly what to do. I have girl scout troops too who need the info-I want them to succeed so badly! Thank you so much! Hi Diane, we have about 100 common milkweed plants, but none of them were started from seed. I gave some to a friend and he just put them in the refrigerator for a month and most of them germinated. I am trying an experiment with some common seeds and will be talking about it in my newsletter next week. I’m trying both a dry and a wet stratification to see if there is a difference. Unfortunately, I won’t have any results for you until April. If your seeds are fresh (and mature) you should have a good germination rate either way. I have found a good way to germinate is to take the seeds and put them in a wet paper towel and then in a plastic bag. Place this bag on a constant warm heat source such as on top of a grow light, or maybe on top of the fridge. Whatever will warm the bag from 70-80 degrees. The seed doesn’t know it’s not in the soil, and really doesn’t care as long as it has it’s moisture and warmth. Germination can take a few weeks, but I would check every two or three days. Once you see the root start to emerge from the seed you are ready to plant into the ground or pot. Not sure where you live, but if you are patient I would say wait to just germinate and plant outside when the root first busts out of the seed. The plant should still grow good this year and next year it will be game on along with less disruption of the tender young plant. This year we are using wet coffee filters in the refrigerator, then planting in a pot outdoors. Seedlings are easy to transplant…it’s the mature plants with taproots that have issues. I would get another pod…you could still try the ones you have, but don’t rely on them as your main source. Your thought that sap may have leaked into the pod and hardened does make sense. The pod that we have was cracked open, but when we tried to harvest the seeds, we noticed that none of the seeds were missing, and the fluff was basically flat and perfectly in place as if the pod had just opened? I just watched the video on how to harvest common milkweed seeds on your site and it looks like the hardest part of the job is getting the fluff off of your fingers when your done, not removing the seeds from the fluff. I know you haven’t run into this issue before, but I was wondering what your gut feeling is on these seeds? Would you keep seeds that don’t want to come off their fluff, or would you go back out and try to find another pod that doesn’t have separation anxiety? I sure hope the caterpillars appreciate all we do for them. By the way, thank you for all you do and the patience you have in answering all our questions. I have a quick question on common milkweed. For some reason I am having trouble separating the common milkweed seed from white fuzz that the seeds use to float around on. I try gently twisting the seeds around in a circle, but more times than not, I literally crack a small portion of the seed off? These seeds seem be to cemented to their fuzz? Do you find that common milkweed seeds seem to be attached to their fuzz ten times more than say swamp or tropical milkweed seeds which seem to just slide off their fuzz when collected in the fall? I have a large patch of tall sumac in the back of my yard. Do you think I would have any luck planting common milkweed in the filtered sunlight under those sumacs? It’s the one location in my yard where they could spread and be as invasive as they like (just like the sumac above them). It’s not full sun, but it’s not dark shade either. 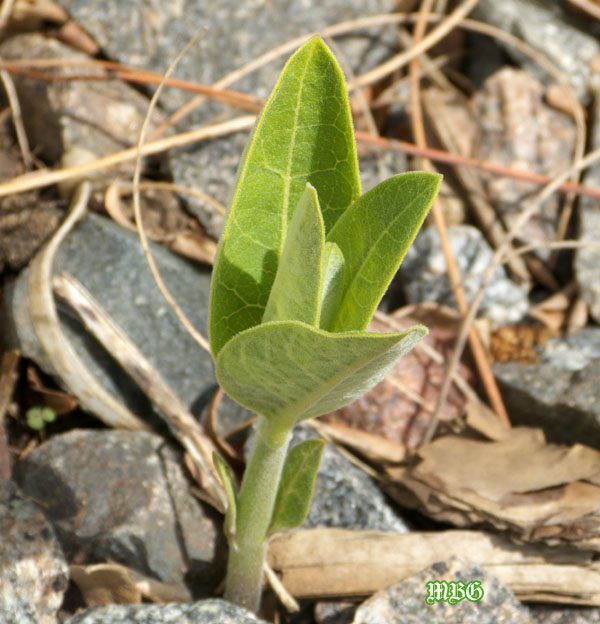 Hi Jim, common milkweed will definitely grow in partial shade. I would try it and see what happens. Good luck! Hi, Tony! I manage the butterfly garden for a community center in my neighborhood. There’s a very successful patch of common milkweed there, but the problem is, it’s right against some very prominent windows and their sign. They’re not thrilled with the height and density in that location. I was going to strategically move some of the shoots in the spring to less troublesome spots, and also put in some swamp milkweed, since it’s shorter/finer, and also a decent host plant. Any other tips for monarch gardening in a location where common milkweed is too tall/dense/”weedy” to be appropriate? My location is in Chicago. Thanks very much. Hi Marilyn, swamp milkweed can get just as tall as common in my experience. You may be better of relocating the patch away from the window…maybe they would agree to let you keep SOME of the milkweed there while you are establishing a new patch?? If you wanted shorter milkweed in front of the sign you could try swamp mw ‘ice ballet’ or plant tropical milkweed plants annually which get to about four feet. There are also lots of shorter native and annual flower ideas you could try. Here are some more milkweed options to consider. Good luck! A friend of mine from Ohio sent me some Milkweed seeds and I am not sure of the type but my question is should I go ahead and plant them now or should I wait until Spring. She sent them to me in September but I have had some health issues and just couldn’t get out and do anything with them. Your help would be appreciated…I am located in Morehead City, North Carolina…..Thanks and have a wonderful year. I have never grown Milkweed before and am excited to have this opportunity to do so..I do love my butterflies. Hi Teresa, congratulations on taking the milkweed plunge! I would first contact your friend and ask what species she sent. Then you can research that “specific” variety and go from there. When you figure out the species, you could always start some indoors, or winter sow. Then you could plant the leftover seeds next to your seedlings in spring. You have options, which is a good thing. I just bought some Pink Milkweed seeds from Amazon. It says they need to be cold stratified, I have only been growing from seeds for two years and never had to do this last year, not sure what to do or where to start? Hopefully it’s not too late! Thanks! Hi, people seem to make a big deal over cold stratification when it’s really a simple process. Just put the seeds in the refrigerator for 1-2 months before planting. If they’re in a paper envelope put them in a plastic bag or container in case of spills. That’s it! Thanks! Yes that is very simple, I read somewhere to put them in a wet paper towel then put in fridge and several other posts, thanks so much! Hi Carol, my only suggestion is stop seeding going forward, and start pulling out unwanted plants next spring. Stopping the seeding has made a huge difference for us, even though the rhizomes still spread too. My problem is having too much Common milkweed. It really multiplies each year. How can I get it under control? I would like to get rid of half of the plants but want to keep a few in a certain area. Is there anything I can spray or drop in the hole that I dig them out of? I tried putting salt on some of the ones I cut out last year but it did no good. Have any good “homemade” recipes?????? Any idea would be appreciated. I visited my sister over Christmas and of course the topic of raising monarch butterflies came up. My sister said that she had a few common milkweed plants along her back fence line and that I was welcome to a few of her seeds. I put on my coat and figured I would have to crawl around the ground to find some seeds, but that’s part of the fun of gardening right? However, when I made my way to the back of her yard, I found that her plants still had seed pods on them. Not only did the plants have seed pods on them, but quite a few of the pods still had seeds in them. I only grow a few varieties of milkweed but by December 25th here in Michigan, my plants are bare and the seeds have been gone for a month or two. Is it normal for common milkweed to hold onto their seeds this late into the year? Do you think that these seeds are still viable? Thanks . Hi Brian, last time I checked a couple of our common plants still had pods attached with seeds inside. I don’t typically let our common seed, so I’m not sure how often this occurs…it probably depends on if the plants are shielded from high winds too. Our common milkweed is up against the house on the south side so it shelters the plants a bit. As for viability, I would guess yes as long as the seeds are fully developed. Hi Dana, you can transplant common milkweed and fall or spring are the best times. The trick is to dig deep so you can get most of the tap root. Make sure you keep the soil moist while the roots get acclimated. If the plant looks stressed after transplanting, try cutting it back. I need to relocate a plant of A. syriaca. This is the first year growing in its current location, but new plants are already growing 18″ from the mother plant. I realize I’ll probably lose the mother when I dig it up, but could you tell me how to divide the rhizomes to plant elsewhere? This may be a silly question, but do the monach caterpillars actually eat the common milkweed leaves? I keep getting different opinions on that. Several people have told me that they only eat the swamp milkweed. I want to raise a few this year, but only have the common variety. Please help:)! Hi Jennifer…not a silly question! Monarchs love common milkweed leaves earlier in the season when the leaves are fresh. The leaves get tough in early August, and you won’t find many eggs on it after that. I ordered from eBay orange milkweed seeds and they sent me blue pebbles saying they are seeds. Are any milkweed plants seeds blue? 2. Contact the ebay vendor you purchased from and tell them to send you new seeds or refund your money. I purchased the Butterfly Weed seeds recently in the blue coating. They are commercially packaged by Ferry Morse seed company and advertised as being “Sow Easy” seeds in an all natural seed coating composed of clay, perlite, and lime. Supposed to be easier handling and visibility for planting. Sold in retail stores. Can I grow common milkweed from a cutting? Hi Iris, most milkweed can be started with cuttings if you use rooting hormone and place in potting soil or sand that is kept moist. It takes about two months before you can plant them. This is something you might try in summer for fall planting. I have the common old milkweed and would like to know what do you do to keep the small mites from infesting it and how to keep it from turning black and sticky. Hi Ethel, I’ve never had these before but have heard rinsing off the plants with water or using insecticidal soap if it’s a bad infestation. Make sure to use the soap as directed and rinse off throughly so it doesn’t harm monarch eggs or cats. Also, if the infestation is localized on a particular part of the plant, you might consider cutting back and discarding. Good luck! I saved MW seeds from last year and did try to stratify them in the fridge for a month and a half before planting outside. None of them sprouted… The seeds are still intact in the dirt. Will they grow next year or should I see directly in the ground this fall? hmmmm James…none sprouted? Were the seeds ripe when you harvested them? 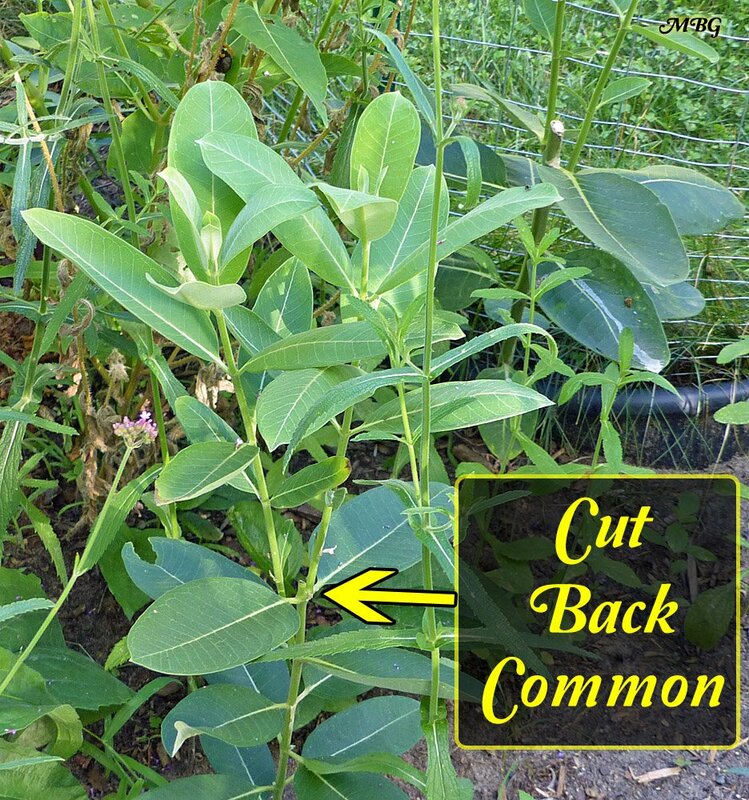 After common milkweed is done blooming, try cutting some of the taller stalks back by 1/3. This should eliminate the need for staking and promote fresh leaf growth the monarchs prefer for laying eggs.